Well that was fun. Board outage was caused by an un-announced migration of servers by GoDaddy on 2/10. As the board was "too large," rather than migrate it they deleted it. The "too large" was caused by an oversized "sessions" data table that needed cleaned out... a 1 button, 5 second operation when the board's up and running. On 2/14 in the AM, after about an hour of heated discussion with GoDaddy I got the board back, in the form of a dumped backup about a week prior to the migration. I'd planned to get it re-installed in the afternoon... but then the shooting at Stoneman Douglas, where my son attends school happened, and so it's sat for a bit. This week I finally had time to tackle it: I had to set up a local server stack, reinstalled the SQL database, clean it, then restore it back to GoDaddy. First time I've had to go to these lengths to re-establish the board after an outage and it and took a lot longer to get to than I would have liked, but now I have a better path for doing some serious upgrades that need done to this board. Please check files and links, and let me know here if you find any issues. Good to have the information back at our fingertips!!! Happened to me on one of my forums years ago. Had a heII of a time stitching it back together, get it done, 2 days later, down again (HACKED), got frustrated, switched to a different host. This wasn't GoDaddy, it was Velcom out of Canada. They refused to updated their d*** PHP SQL version and the hacker kept getting in. Switched to liquid web, problem solved. I think I lost about a months worth though. If places like this didnt exist, id have no scooter. No scooter means no fun. THANK YOU! Im one of the mechanically tarded that are heavily dependent on other peoples knowledge. Thank you for all of your hard work. 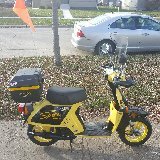 It is almost time to get the scooters running.